Asmara is the capital city of Eritrea. Due to a shared history with Ethiopia, the cuisine is very similar with a noticeable difference in the names of dishes on the menu. If you are unfamiliar with food from this part of the world, you can expect an assortment of vegetarian, chicken and meat based curries served over Injera, a large, sour pancake. 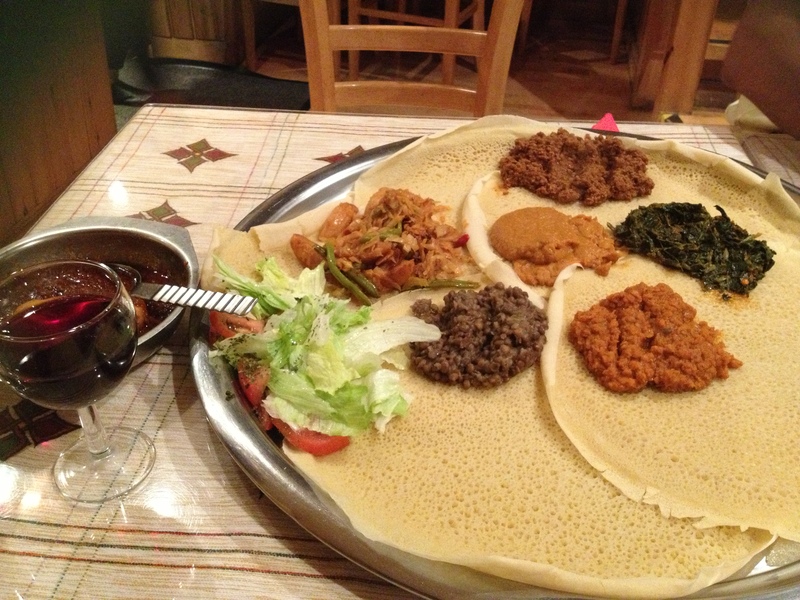 There are no individual plates – you scoop up these fabulous dishes using the Injera and your hands. We ordered the Asmara vegetarian platter with a variety of vegetables and lentil based curries including the delicious Shiro (pureed spiced chickpeas). We also added on the Chicken Derho (spicy chicken stew also known as Chicken Wat at Ethiopian restaurants) and the Minchet Abish (minced meat stew) to our Injera full of Eritrean yumminess! The restaurant has ZERO ambience but the gorgeous food more than makes up for it. The service is quick but warm and the dishes are very reasonably priced. Highly recommended the next time you are in the mood for something off the beaten path!